My name is Lochlan Murdoch and I am ten years old. I am asking if you could help me with a fundraising event I would like to carry out on behalf of JDRF Scotland and The Kris Boyd Charity. 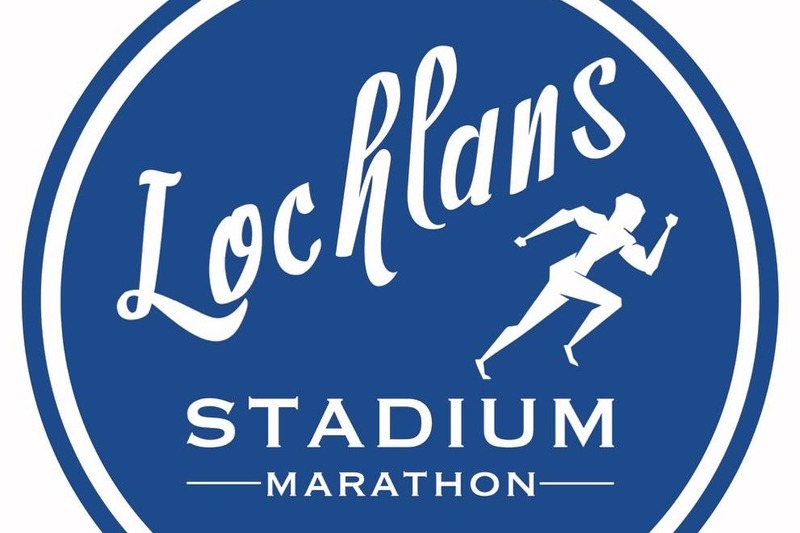 The fundraising idea I have had is to do a STADIUM MARATHON. Twenty eight miles over all 12 SPFL grounds, Hampden Park and Townhead Park in Cumnock. I have type 1 diabetes and was diagnosed five and a half years ago so this is why I really want to raise funds for JDRF Scotland as they do lots of work and research for people like me and also hopefully one day find a cure for type1. Also, in May 2018 I suffered a really bad leg break whilst playing football for my team, Cumnock Juniors 2008's, which I had to have an operation to fix and be in cast and then a leg brace for 4 months. Recently, I had to have another operation on my knee to help with my recovery and hopefully I will be back playing football again with my team in the summer. When I broke my leg I got very sad and felt left out and really alone. I lost my confidence because I couldn't play football. I stopped going to watch training and games because I felt so sad at not being able to take part and play with my friends. Once I told my mum how I was feeling she got me some help and I'm starting to feel a bit better. This is why I have chosen The Kris Boyd Charity as I know it is important to tell someone how you are feeling. So, I decided I wanted to challenge myself and get myself back to being fit and healthy and to reach a new goal. Football is my absolute favourite thing in the world and Kilmarnock FC are my favourite team. 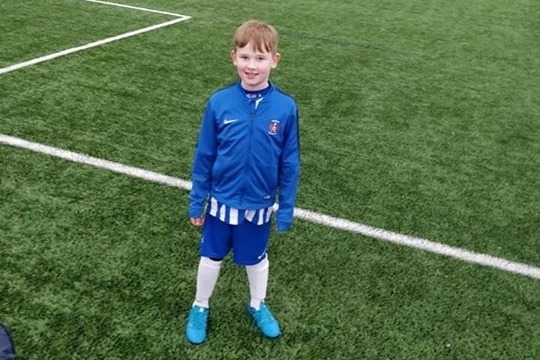 I train with Kilmarnock Development team too and when I am older I want to play professional football like Jamie MacDonald and Kris Boyd. I don't want type1 or being sad stop me from achieving everything I want to achieve. Andy Rose (Motherwell FC) and Scott Allan(Celtic FC) have type 1diabetes and it certainly doesn't stop them and they are such an inspiration to me. I am visiting alll 12 SPFL grounds and complete 8 laps of the pitch at each ground and our National Stadium, Hampden Park. This would mean I would do 2 miles at each stadium. If I do the same at Townhead Park then that means I will have completed 28 miles and my stadium marathon. 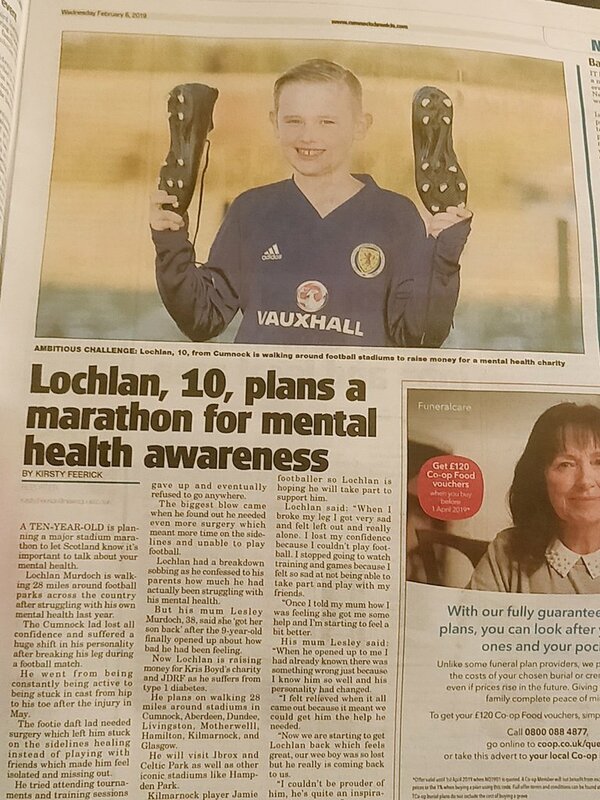 I am starting at Townhead Park on Tuesday 2nd of April in the evening before starting the SPFL clubs tour on Wednesday 3rd April before completing the challenge at Rugby Park on Saturday 6th April in the morning before the Kilmarnock game that day. I am very excited about my challenge and I hope I can make lots of money for my chosen charities. I hope you can help me reach my goal of completing the challenge. Lovely new logo for the event.